Hidradenitis suppurativa (HS) causes you to get painful bumps under your skin in the hair roots near some of your sweat glands. There's no cure, but treatments and lifestyle changes can bring some relief and cut down on flare-ups. Most experts think they’re caused by blockages in the hair roots. They usually happen in areas where you have hair, such as under your arms, in the groin, and between the buttocks. But you can also get outbreaks in places where your skin rubs together, such as between your thighs or, for women, under the breasts. The bumps can get infected. When that happens, pockets form under the skin and fill with pus that can smell bad when they break open. They can leave scars, too. To keep new bumps from forming, get treatment as soon as you can. Because this condition lasts a long time, it can be frustrating, and it can take an emotional toll on you. Make sure you get the support you need. Talk to your doctor about joining a support group, where you can meet with other people who are going through the same things. They can help you work through your feelings about the skin condition. Talk to your close family and friends about it, or consider talking with a professional counselor. They can help make sure you don't let your skin problems keep you from enjoying an active social life. Doctors aren't sure what causes hidradenitis suppurativa. The skin problems start when hair follicles get blocked. You often get the first symptoms in your teens or 20s. It's more common in women than in men, and also in those who are overweight or smoke. About a third of people who get HS have a relative with it. And it's more likely to happen if you've had acne. Scientists know what things don't set off HS. You don't get it from not washing enough. And it's not related to using deodorants or powders or shaving your underarms. You also can't catch it from someone else or give it to another person. The first warning sign of hidradenitis suppurativa is sometimes just a single, painful bump that gets inflamed. It can last for several days or months. There can be repeated outbreaks of a single bump in the same location or the same general area. The bumps can turn into pockets of pus under the skin that leak and have a bad smell. They can also be itchy. You can get them in one place or several areas at once. If the bumps are deep, they can turn into scars when they heal. Some people get tunnels under their skin, called sinus tracts, which connect different areas of HS outbreaks. The bumps and leaky pockets can go away and come back. In severe cases, they don't fully heal. Your doctor will check your skin and make a diagnosis based on where the bumps and pockets are, and how often you have them. Are they giving you pain? Have you had these symptoms in the past? Have any blood relatives had this problem? You usually don't need any tests to confirm a diagnosis. Sometimes, in order to rule out other kinds of infections, your doctor will take a sample of the pus and send it to a lab for testing. How mild or severe is my hidradenitis suppurativa? Should I take an antibiotic? What about other medications? Could these medications cause side effects? What lifestyle changes should I make to improve my illness? If my symptoms get worse, when should I call you? Will the disorder go away on its own? The type of treatment you get is based on how severe a case you have. It may take some trial and error for you and your doctor to find the one that works best for you. Warm compresses. You might try this first if your case is mild. To make a compress, run a clean washcloth under hot water and place it on your skin for 10 minutes. Antibiotics. These are meds that fight infections. You need a prescription to get them. You can take them as a pill, or you can use a cream that you spread on your skin. They can keep your symptoms from getting worse and help curb more outbreaks. There are a lot of different antibiotics that your doctor can recommend. At first, you may take clindamycin or . Most people take them for 2 to 3 months. If that doesn't help, your doctor may suggest a combination treatment of clindamycin and rifampin (Rifadin, Rimactane). Corticosteroids. Your doctor injects this medicine into the bumps. It can ease inflammation, pain, and swelling. You usually get these shots once a month for up to 3 months. If your case is severe, your doctor may recommend you take steroids by mouth. Oral retinoids. Your doctor may suggest a retinoid medication in a pill, such as acitretin (Soriatane) or isotretinoin (Accutane), which you may have heard about as an acne treatment. Both drugs can improve severe cases of hidradenitis suppurativa. Topical resorcinol. This is a cream that your doctor prescribes. You put it on inflamed areas of your skin. It has chemicals that peel the skin. Hormone therapy. Some women find that their condition gets better if they take birth control pills or a drug called spironolactone. Biologics. These medications work on your immune system, your body's defense system against germs. You take them by getting a shot, either at the doctor's office or sometimes by doing it yourself. Or you may need to get the meds through an IV in your veins. This is done at a clinic or hospital. Adalimumab (Humira). This product is the only one approved by the FDA to treat HS. Infliximab (Remicade). This product is not FDA approved, but doctors still use it to treat the condition. Anakinra, canakinumab, and ustekinumab may help some people with severe or hard-to-treat HS. Researchers are still studying their effectiveness. While biologics can clear up HS for a long time, they can also cause serious side effects, so they're used only for severe cases. Surgery. If your bumps grow deep into your skin, certain procedures can help. If you're having problems in a small area, your doctor can cut open pockets to drain pus, which gives you short-term relief. In another procedure called deroofing, a surgeon can turn deep, painful bumps and pockets into scars that won’t hurt. It's an option if you have painful bumps that come back over and over. Another type of surgery involves cutting out the skin in the problem spots. After this procedure, your doctor will do a skin graft. He removes skin from another part of your body and uses it to cover the area where you had the operation. Laser surgery is another option to clear new, deep bumps. It destroys hair follicles, the shafts in your skin where hair grows. You may need several treatments. Surgery can help with stubborn or severe cases of HS, but for some people, the disease may come back in the same area or another part of the body. There are many things you can do that are a big part of managing your skin problems. Try these tips to make your HS less severe and lower the number of outbreaks you get. Lose extra weight. This can ease your symptoms by reducing the surfaces where you skin rubs together. That way, you'll have fewer flare-ups. Quit smoking . It not only cuts your risk of cancer and heart disease, but it can make your HS less severe. Talk to your doctor about finding programs that can help you break the habit. Stop shaving in trouble spots. This can keep you from irritating your skin. Ask a dermatologist about other ways to get rid of unwanted hair. Wear loose-fitting clothes. Outfits that are tight can cause your skin to rub together, making your flare-ups worse. Stay cool. You can get flare-ups from getting too warm and sweating. But be careful about using deodorants, which can sometimes irritate your skin. Ask your dermatologist for suggestions about an antiperspirant that won't cause problems. Keep clean. Wash the HS areas gently every day with your fingers. Scrubbing with a washcloth or brush can irritate your skin. Use an antibacterial soap, which can help get rid of odor. Use the right bandage. If a bump is leaking, make sure the bandage you put on it doesn't stick to your skin. Use plenty of petroleum jelly on the gauze that covers the area. Avoid using adhesive tape as much as possible. HS can last for years, but early treatment can help you feel better and lower the risk of flare-ups. 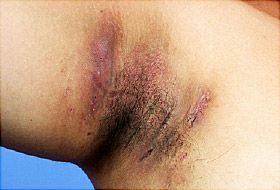 In severe cases, hidradenitis suppurativa can get worse over time and cause scars. Surgery can help, although the disease comes back about one-third of the time. If that happens, it's still important to keep up with lifestyle changes that can ease your discomfort. It's important to turn to people you trust to give you the backing you need while you get treated. Family and close friends can be a big help. So can support groups, where you can talk freely with people who understand your situation. Ask your doctor about how to find a group near you. You can get more information about HS on the website of the Hidradenitis Suppurativa Foundation. American Academy of Dermatology: "Hidradenitis Suppurativa: Diagnosis, Treatment, and Outcome," "Hidradenitis Suppurativa: Tips for Managing."